HEA was hired to provide commissioning services for a higher education dormitory. During the test and balance (TAB) period of the project, it was discovered by the TAB contractor and HEA that the dual temperature system was unable to be balanced. It was also noted that the extremities of the two wings of all three floors could not provide any heat to the occupied dorm rooms. This resulted in parents pulling students out of school due to the dorms not being able to be heated and 85% redo of the building piping systems - a $250,000 error! 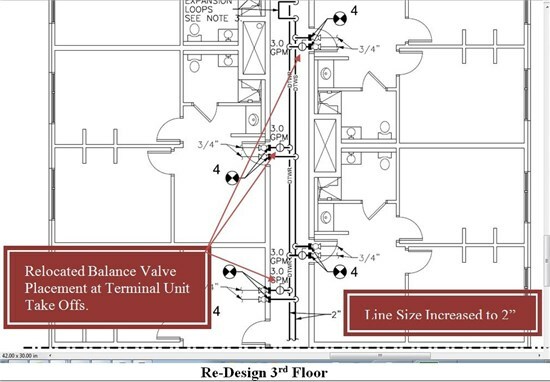 Prior to HEA’s involvement on the project the construction team issued an RFI to the engineer of record in regards to the balance valve locations. The valves were designed in the main piping header between terminal units. Typically, balance valves are placed in line feeding terminal units. As the project progressed, and no clear path on resolving the issue was proposed by the engineer of record, HEA suggested that an engineering peer review be performed by a separate mechanical engineer. The findings of the peer review determined that the balance valves were initially designed in the incorrect locations. 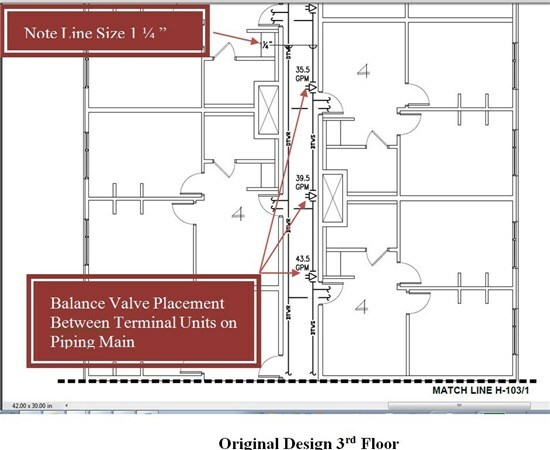 Other finding of the peer review showed that the secondary building pumps were not correctly sized and that the piping of the dual temperature system was actually undersized in many areas. These finding resulted in a redesign and a separate mechanical project one year after the initial opening of the facility. HEA postponed functional testing until the redesigned system was installed and balanced. Once completed HEA performed functional testing and all issues noted the year prior with not being able to properly heat the dorm rooms were found to be resolved.